When you arrive at Seattle Park ‘N Fly, you’ll be greeted by our professional valet staff who will collect your luggage and get you to the terminal. You won’t waste time searching for a parking stall. We’ll take care of that, plus we’ll secure your keys while you’re away, and have your car ready for you upon return. Reserving your parking spot at SeaTac International Airport is a breeze with Park ‘N Fly’s convenient online reservation system. Located within a few minutes from the airport, our 450+ car lot is the perfect place to leave your vehicle while you travel. Use your laptop, tablet, or computer to reserve your spot online and relax knowing your car will be safe while you enjoy your vacation. Our corporate account program fits any size of business that needs to provide their frequent travelers with the best service and rates. Apply online or ask us for an enrollment form on your next visit. We know that traveling is a trying experience, so we offer another way to take the hassle out of airport parking. With Express-Pay, you bypass the checkout line, go straight to your vehicle and on your way. 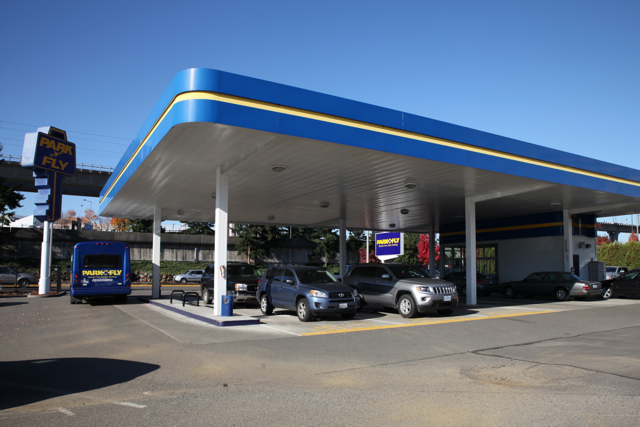 Our lot is located just a few hundred feet from the Link Light Rail Station. 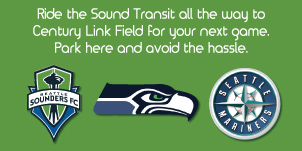 Check out our Game Day Special for all Seattle sports fans! Enjoy easy parking and a short ride to Centurylink and Safeco Field. Propane autogas-fueled shuttles reduce our carbon footprint by 90 percent compared to traditional gas-fueled vehicles. We take pride in doing our part to take care of the beautiful Pacific Northwest. Need to reserve a rental car? Looking for a quality used car?